Your hands are your weapons in boxing so you have to protect them. There are hundreds of little bones in your hands which will break and cripple you if you do not take the necessary precautions when boxing . The best way to do that is by learning how to wrap your hands which provides protection for those bones like your knuckles. Hand wraps come in various sizes and colours. I recommend a 180" hand wrap like these everlast boxing hand wraps. They give you enough length to wrap your hands in a number of different ways, whichever suits you the best. 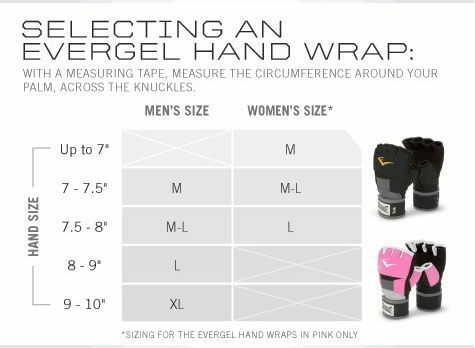 Everlast boxing hand wraps are a bit longer and slightly elastic which makes them form a tighter wrap around your hands. They provide better protection. At any rate, choose one and use them and get the ones with velcro ties as they are more convenient to use. As for how you should wrap your hands. If your boxing handwraps don't feel right, do them over. Proper tightness of handwraps is important. Wraps should be tight enough to stay firmly in place, but not too tight or they will cut off your circulation. It takes practice. Handwraps have a top and bottom. The reason is that the Velcro should be face up when finished. If you started with the wrong side down is no big deal. On the last step around the wrist, flip(twist) the wraps over. Boxing Handwraps can be machine washed. Hang up to dry. Depending on how much you sweat, it is suggested to roll your boxing handwraps back up when finished with your workout. If your boxing several times a week, buy a couple pairs of boxing handwraps.